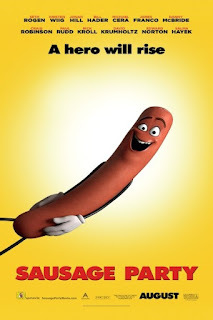 It may look like the usual output of Pixar/Disney and their many imitators, but make no mistake: SAUSAGE PARTY is not for the kids. Co-directed by Greg Tiernan (an animation veteran who has worked for Disney, Don Bluth, and the folks behind Thomas the Tank Engine) and Conrad Vernon (director of MONSTERS VS. ALIENS and MADAGASCAR 3: EUROPE'S MOST WANTED) from a screenplay written by Kyle Hunter, Ariel Shaffir, Seth Rogen, and Evan Goldberg, this is easily the edgiest animated feature to hit mainstream theatres since Ralph Bakshi's early seventies output (FRITZ THE CAT, COONSKIN, etc.). The plot is sort of like TOY STORY for food, if the toys all wanted to get laid really bad, and in their quest for sexual release, wound up having their religious belief systems shaken to the core. Basically, horny hot dog Frank (voiced by Seth Rogen) can't wait to be chosen by one of "the gods" (aka shoppers) and taken to "the great beyond" where he will finally get to slide into gorgeous bun Brenda (Kristen Wiig). But when a shopping cart accident results in a horrifying (and hilarious) disaster, Frank winds up learning the truth behind the myth: the gods are really monsters, who torture and kill the groceries for sustenance. Now Frank has to warn his fellow foodstuffs of the danger that awaits them while trying to reunite with Brenda and avoid the vengeance of a literal douche (Nick Kroll) who blames Frank for the broken nozzle that will keep him from fulfilling his destiny. Along the way we also meet a bagel (Edward Norton) and a lavash (David Krumholz) who are fighting over shelf space, a lesbian taco (Salma Hayeck), a deformed weiner (Michael Cera), and a wise old Native American liquor bottle (Bill Hader), among others. All those folks who routinely get upset about Hollywood trying to undermine religion and traditional moral values, this time you're absolutely right. Never has a film promoted atheism and pan sexuality more vigorously than this one. But don't worry, SJW type liberals will probably get worked up over the politically incorrect racial humor. There's something here to offend just about everyone. But is it funny? Yes, yes it is. Obviously not if you're offended by its vulgarity or message, no. But if you don't mind comedy that not only pushes but obliterates the boundaries of good taste, there are a lot of laughs to be had. 3 out of 4 stars.